, was born in 1515, in Dauphmy, according to some authors, but according to others in Savoy. Spon and Leti mention Chatillon as the place of his birth; of his early life we have little information. We are told that Calvin conceived such an esteem and friendship for him, during the stay he made at Strasbourg in 154-0 and 1541, that he lodged him for some days at his house, and procured him a regent’s place in the college of Geneva. 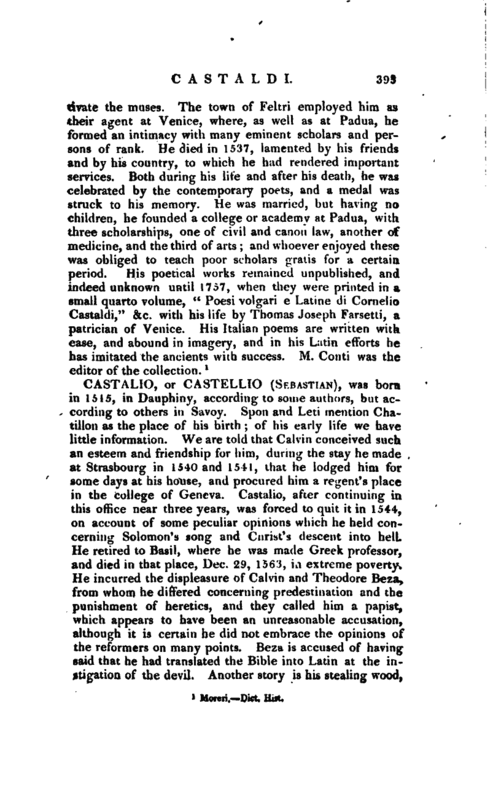 Castalio, after continuing in this office near three years, was forced to quit it in 1544, on account of some peculiar opinions which he held concerning Solomon’s song and Christ’s descent into hell. He retired to Basil, where he was made Greek professor, and died in that place, Dec. 29, 1563, in extreme poverty. He incurred the displeasure of Calvin and Theodore Beza, from whom he differed concerning predestination and the punishment of heretics, and they called him a papist, which appears to have been an unreasonable accusation, although it is certain he did not embrace the opinions of the reformers on many points. 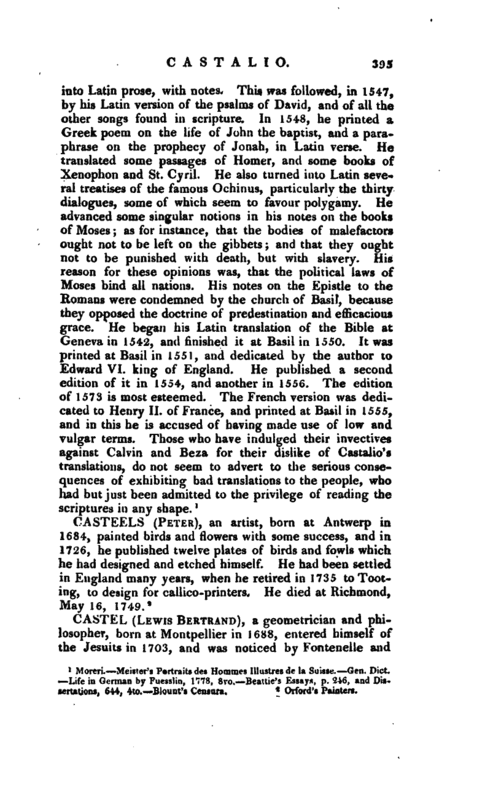 Beza is accused of having said that he had translated the Bible into Latin at the instigation of the devil. Another story is his stealing wood, | which is thus related: when rivers overflow, they frequently carry down several pieces of wood, which any body may lawfully get and keep for his own use. Castalio, who was very poor, and had a wife and eight children, got with a harping-iron some wood floating upon the Rhine. When Calvin and Beza heard of it, they proclaimed every where that he had stolen some wood belonging to his neighbour. This incongruous mixture of sublime ideas and words comparatively mean, degrades the noblest poetry almost to the level of burlesque. 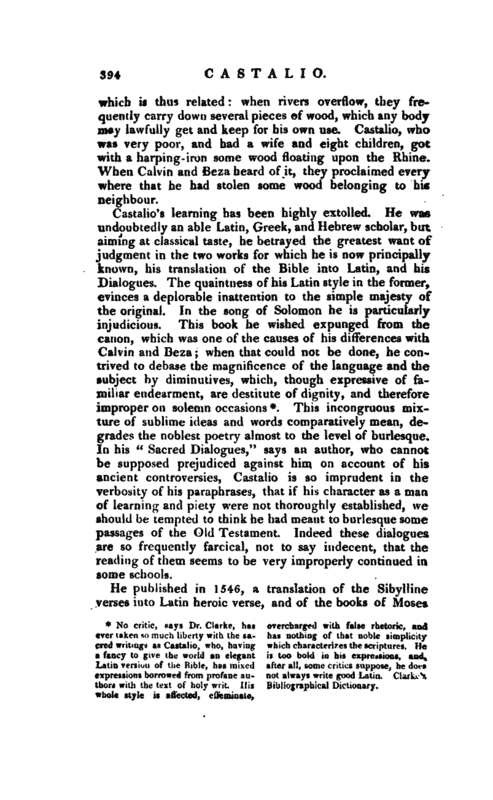 In his “Sacred Dialogues,” says an author, who cannot be supposed prejudiced against him on account of his ancient controversies, Castalio is so imprudent in the verbosity of his paraphrases, that if his character as a man of learning and piety were not thoroughly established, we should be tempted to think he had meant to burlesque some passages of the Old Testament. Indeed these dialogues are so frequently farcical, not to say indecent, that the reading of them seems to be very improperly continued in some schools. Moreri. Meister’s Portraits des Hommes Illustres de la Suisse. Gen. Dict. Life in German by —Fuesslin, 1778, 8vo. Seattle’s Essays, p. 246, and Dissertations, 644, 4to, Blount’s Censura.